Kids with Asthma -- Childhood breathing problems can be stressful and frightening for parents. After all, you want your child to be able to play just like every other child. You don't want him or her to have to live in a bubble or struggle to breathe. Unfortunately, breathing problems--usually related to asthma and allergies--are becoming more and more common in Western countries. Experts are still exploring why this is so. But the bottom line is, if you're a parent of a young child, there's a good chance you'll have to deal with asthma at some point in time. So what is a parent to do? Just give up and accept that your child will never be "normal"? Of course not! The good news is, there are quite a few positive actions you can take that will go a long way towards helping your child live a happy, active life. Step 1: First, you need to understand asthma. Knowledge is power, and knowing what actions to take start with understanding what's going on in your child's body. Asthma is a chronic breathing problem that interferes with your child's ability to get air in and out of his or her lungs. When your child has asthma, the airways often become red, swollen and irritated. This means the passages become narrower, which makes it harder for the air to flow in and out. Also, the airways overreact by producing large amounts of mucus, which can clog the airways further. This causes symptoms such as coughing, wheezing, and shortness of breath. There is no cure for asthma, but there are many medicines and treatments that can keep it under control. Some children do grow out of asthma over time as well. Step 2: Get a handle on your child's asthma triggers. It's a well-known fact that asthma symptoms are set off--or triggered--by certain environmental substances. For unknown reasons, your child's body "sees" these triggers as threats, even though most people are not bothered by them. The lungs then overreact by triggering an asthma attack. The most common asthma triggers in children are pollen, dust, molds, food allergies, pet dander, and even colds. Scents and cigarette smoke can also set off an asthma attack. 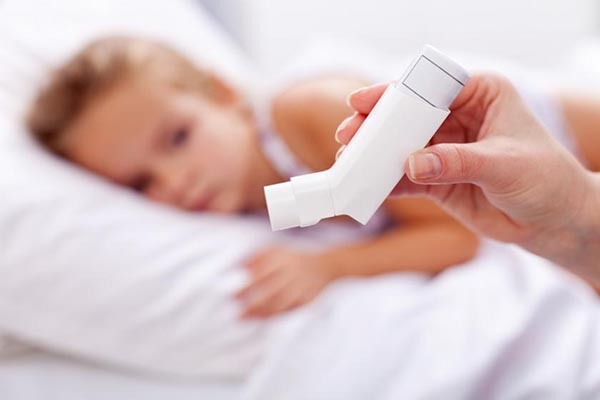 As a parent, you will be able to notice the things that trigger your child's asthma symptoms. Make note of the patterns, and then do your best to help your child avoid those triggers as much as possible. Step 3: Play an active role in your child's health care. Children who have asthma do need medical care. It's important to consult with your pediatrician or an asthma specialist and get your child on a treatment program that will help control or prevent his or her symptoms. The doctor may prescribe the treatment, but it will be up to you to carry it out. It is essential to follow the plan laid out for your child to the letter. Skipping doses of medicine or nebulizer treatments--even on good days--will lead to health problems sooner or later... probably sooner. So, talk with your health care professional. Ask questions until you are sure you understand exactly what is going on and what to do for your child. Ask your child's doctor to help you fill out an "Asthma Action Plan" that guides you when to take emergency action during asthma attacks or when an attack is building. Lastly, keep your child's doctor informed about what is working or not working. Report when your child's symptoms change. The doctor will not know when to update the plan of treatment unless you keep him or her informed. So, in summary, parents are in the best position to help their children with asthma stay healthy and live active lives like other kids. All it takes is a healthy dose of knowledge, good observation skills, active communication with the care team, and a generous helping of love.